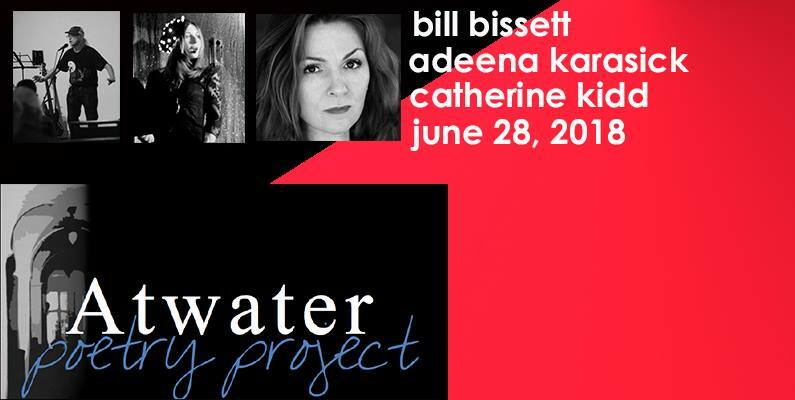 The Atwater Poetry Project presents bill bissett, Adeena Karasick and Catherine Kidd. The event is FREE and everyone is welcome. Books by the poets will be for sale. More info here & event info excerpted below. “CATHERINE KIDD’S performance poetry has been described as “an adult blend of Dr. Suess and Aesop’s fables.” Her solo show Sea Peach toured to the Edinburgh Fringe, Singapore Fringe, and Spier Arts Poetry festival in Cape Town, SA. She is author of the novel Missing the Ark and poetry collection Bipolar Bear. Her latest work Hyena Subpoena was nominated for an A.M Klein Prize, touring across the country last summer in a camper van. Cat was born in Montreal. BILL BISSETT, originalee from lunaria on th first childrns shuttul from ther whn th oxygen ran out 2 erth n still trying 2 undrstand erthling wayze my first loves drawing painting n sound n vizual poetree most recent art shows th secret handshake toronto n lunarian life niagara arts centr st catherines n my mostrecent books ar th book n hungree throat both from talonbooks n most recent cds nothing will hurt with pete dako n we ar almost ther with malcolm biddle. ADEENA KARASICK, Ph.D is a New York-based Canadian poet, performer, cultural theorist and media artist and the author of eight books of poetry and poetics. Her Kabbalistically inflected, urban, Jewish feminist mashups have been described as “electricity in language” (Nicole Brossard,) “proto-ecstatic jet-propulsive word torsion” (George Quasha,) noted for their “cross-fertilization of punning and knowing, theatre and theory” (Charles Bernstein) “a twined virtuosity of mind and ear which leaves the reader deliciously lost in Karasick’s signature ‘syllabic labyrinth’” (Craig Dworkin.) Most recently is Checking In (Talonbooks, 2018) and Salomé: Woman of Valor (University of Padova Press, Italy, 2017.) She teaches Literature and Critical Theory for the Humanities and Media Studies Department at Pratt Institute, is co-founding Artistic Director of the KlezKanada Poetry Festival and Retreat, Poetry Editor for Explorations in Media Ecology, 2017 Andrew W. Mellon Foundation Award recipient and winner of the 2016 Voce Donna Italia award for her contributions to feminist thinking. The “Adeena Karasick Archive” has been established at Special Collections, Simon Fraser University. The Atwater Poetry Project is committed to being a safer space and anti-oppression space. We ask all guests to be respectful and non-discriminatory toward others within the reading space and in the library where the series is located. Violent, discriminatory or harmful behaviour will not be tolerated. We acknowledge that this reading series takes place on unceded Indigenous lands of the Kanien’kehá:ka people in Tiohtiá:ke/Montreal.